As I write this post, it is only 14 degrees above zero Fahrenheit in Detroit. Moreover, the weather forecast calls for it to get even colder and for this weather to last for more than a week. Weather such as this poses some very serious problems for those among us who are already having a tough time. Anyone who lives within the city of Detroit who does not have heat in their home is asked to call the Buildings, Safety Engineering and Environmental Department for help. Their telephone number is (313) 628-2451. Also, anyone who finds themselves suffering from extreme cold is asked to call 9-1-1. 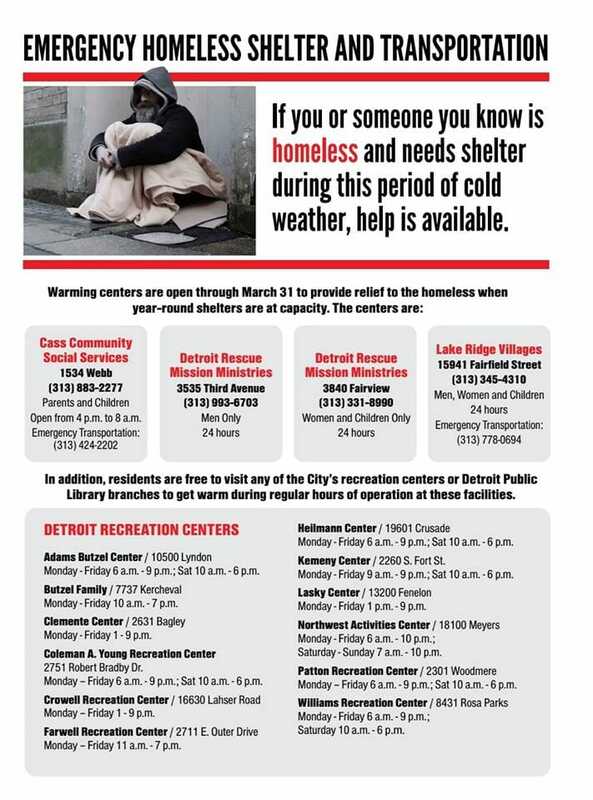 Finally, the City of Detroit has released a flyer outlining places where people can take emergency shelter from this cold weather. It is located above. Please share this information widely. One never knows who will need it.